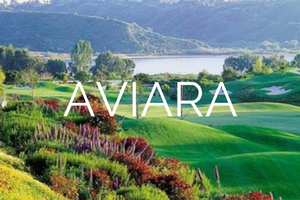 Aviara is an affluent resort neighborhood in the southern part of Carlsbad, located in San Diego County, California. The community is approximately 25 minutes from the downtown portion of the city of San Diego. As of the 2005 census, it had a total population of 5,050. In 1989 the community was developed and later incorporated into nearby Carlsbad. The faux gated community is set in the hills of South Carlsbad, overlooking the Pacific Ocean and Batiquitos Lagoon. Aviara is just north of Encinitas and west of La Costa. The community is mostly residential except for the Park Hyatt Resort (formerly the Four Seasons Resort) and Aviara golf and country club. In the annual Forbes magazine ranking of “Most Expensive Zip Codes” in the U.S., Aviara’s 92011 Zip code ranked among some of the most expensive in the nation. Many properties command views of the ocean, Batiquitos Lagoon, and Aviara golf course. The community is noted for its lush landscaping, gated communities, and abundance of jacaranda trees that frame many of the streets.